Will Enzo Stand the Test of Time? 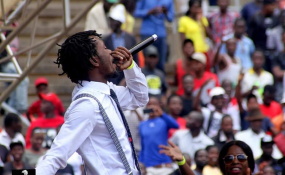 Fast-rising Zim dancehall chanter, Enzo Ishall has become the latest culprit involved in breaching intellectual property rights after stealing a video concept for his "Magate" song from Boss Pumacol's "Zvirikutamba Zvega." A comparison of the two videos, "Magate" and "Zvirikutamba Zvega" directed by Vusa "BLAQS" Hlatshwayo and Gerald "Zezuru" Mushure of Studio Art Pictures (SAP) Africa respectively, glaringly exposes intellectual property infringement by the Kanjiva hitmaker. Speaking to 263Chat, Mushure who shot and directed "Zvirikutamba Zvega" was shy to openly point out that his concept was 'copied and pasted' on "Magate" video though he admitted to some similarities. "It's a bit tricky to conclude anything because there are parts that are similar to our video. At the same time, it is possible for the director of "Magate" video to have thought along the same lines as we did, which is absolutely possible since we are both video directors," said Mushure. Efforts to get a comment from Blaqs were fruitfuless as he quickly dropped the call soon after 263Chat questione the origins of "Magate" video concept. Enzo had not responded to the questions by the time of publishing. "Magate" visuals were released yesterday and have 'failed' to meet expectations with most people wishing if raunchy dancer, Beverly "Bev" Sibanda had starred instead of KikkyBadAss.